I usually have poor to absent relations with editors because they have a habit of desiring changes and I resist changes. 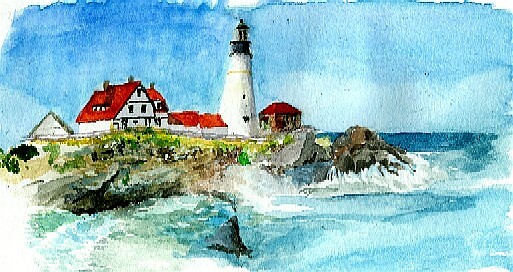 The Story of "Maine Shore"
Worked a bit on the Maine Shore watercolor, and love Vivaldi while I paint. I think it's the lack of steady percussion. 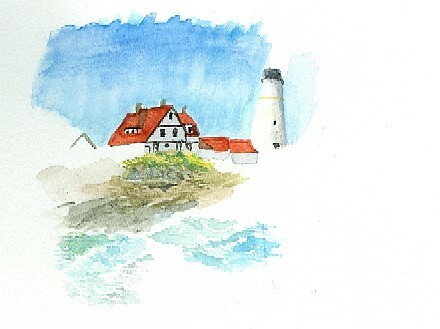 Writing is about rhythm; painting is not. Classical music is a better fit. Tried my new brushes, and they are awesome. The brushes are Princeton, and the one displayed is a Liner #20, and it holds its point very well. I'll buy more of this line of brush. 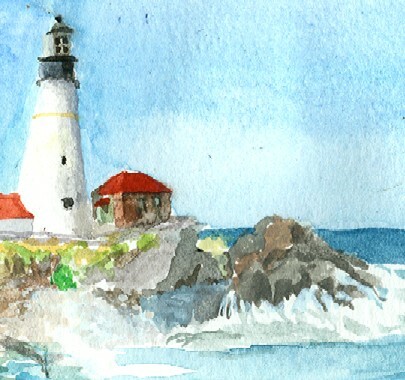 Read the whole story of "Maine Shore"
I'm about halfway done. Maybe less. But I hate my scanner. It darkens part of the picture. I finished my little sketch. Whenever I spend quite a bit of time away from painting, it's like I forget how. Then it comes back to me. I like the rock on the right and the water draining off it. It took, like, 2 minutes to do that and it was done near the end of the work. The rest took a lot longer. But I feel as though I'm ready to paint a lot. Let's hope. I want to have about 20 works for the fair next year. I'm totally in love with my new setup. In spite of the fact that I bought the drafting table in June, this is the first work that I've done on it - and it's August fercryingoutloud! 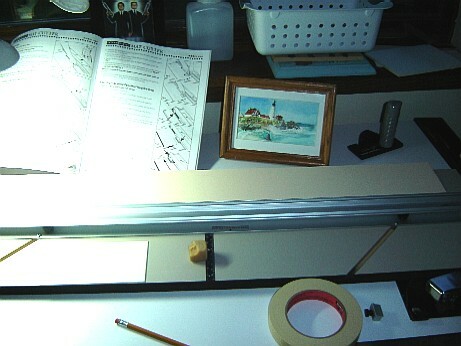 Also, love the lamp with the magnifying glass. But I need one more lamp - bigger, taller. 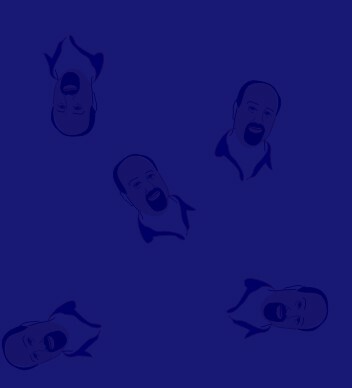 ETC: Next stop, the 8 x 10 version of this. I'll be working on the value sketch in a day or so. I had some trouble with the grassy rocks under the house and to the left of it, so I hope to begin to work that out in the sketch. Jacob loves to ride on the interstate. The speed, the semi's that join us on the road, the absence of traffic lights... he loves the interstate. So this morning after his swimming lesson, I drove him to downtown Des Moines and we visited the Art Store. 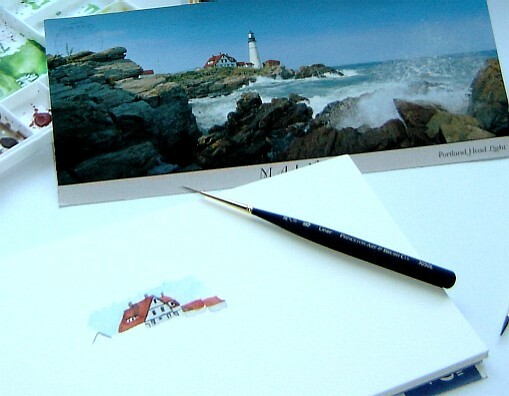 I wanted to get a few more brushes and possibly a mat cutter for framing my paintings. We browsed around and I found more Princeton brushes like the ones that I bought recently. Their tips are very springy. They're just excellent. And I did indeed buy a mat cutter: the Logan 450. My mom recently gave me a ton of mat board that she found at a garage sale, so I figured I would shave money by doing it myself. Later this afternoon after the boys leave to go back to Jackie's I'll give it a try. 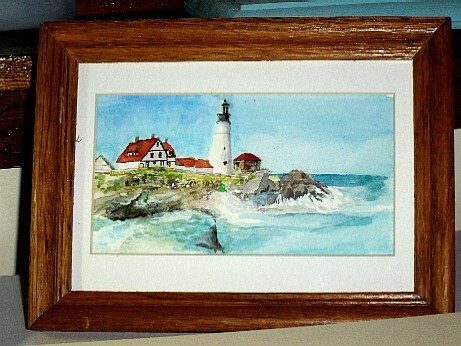 I'd like to frame the smallish Maine Shore painting I did and put it on my desk at work. "Pictures? Plan to stay a while?" "Yes," I replied. "I'm nesting." These have been fleeting thoughts, but ferchrissakes, what a bunch of hooey. My job shouldn't change me. As long as my work is done as expected, who cares? Such an attitude of moulding to the "corporate" image reminds me of a picture from Orbiting the Giant Hairball, where it shows the progression of the large-hearted, expressionsitic free spirit to the graph-papered, small-hearted, rigid automaton cut into the shape of a suited business person. That's crap. People who worry too much about their image will never achieve great things for long, in large part because they'll ultimately be unhappy and they won't know who the hell they are. It's not a sustainable presence. Besides, the business world needs more free spirits. I'm with her. She might have meant that in the context of achievement, but I also think it's true in the context of bending the rules. "Best practice" is never where new money is made. "Best practice" is simply an encapsulation of the rules as we have known them to be, which increasingly doesn't apply to now/today. The world is changing, and we need to be open to that and breathe it all in and know it for what it is, not what it was. So I'll hang a sign that says, "LUNCH" over my desk when I paint while munching grapes. That should lead the expectations of others appropriately. I also plan to bring all of my business books to work. Between the two, it might be a good conversation starter. ETC: I've never cut a mat before and found it remarkably easy, even for all-thumbs me.